ENCINITAS — As someone who’s grown up in an Encinitas pre Interstate-5 and whose life has been on the 101, Steven Cory has seen the world come through the city he loves. Not to mention that he’s done all 40 years in the city where the Cory name has been around for five generations. He grew up surfing Moonlight Beach, where as a kid, he would stow his surfboard at his grandma’s house and then walk a couple hundred yards before he was in the water. And Cory still surfs Moonlight to this day. At the site of the 7-Eleven on D Street and Coast Highway 101, there was once a Mobil gas station that Cory worked at as a youth, pumping gas and washing cars. Almost directly across the street at 587 Coast Highway 101, his grandfather opened Encinitas Dry Good Company Store in 1924, and then later opened a Cory Brother’s men’s clothing store at 553 Coast Highway 101. “When I was a kid (in) Encinitas, those buildings were old,” said Cory. “And they’re still old today and everybody’s coming to see them. “I used to walk and go, ‘these are really old buildings,’ well now they’ve got some new faces on them, but they really haven’t changed…They’re all the same buildings as when I was a kid. I don’t know what that means, but I think people like it,” said Cory. “He’s the best guy in the world to work with,” said Mike Evans, owner of Sea Coast Exclusive Properties and one of Cory’s longtime friends. 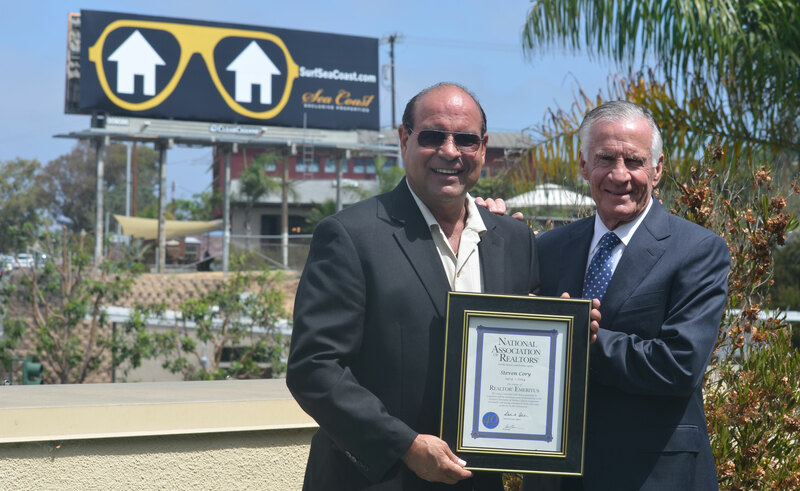 The honor was first bestowed in 1982 and today almost 13,500 of the Realtor Emeritus Awards have been given out, according to the National Association of Realtors. The award, Cory said, is one that he’s honored to have. Cory said that his sense of perseverance comes from his time as a student athlete while attending San Dieguito High School. But ultimately in real estate, he said, it’s all about the amount of work that you’re putting in. Cory said he learned one four-letter word that he still uses all the time in his business — though it may not be one that initially comes to mind in an industry that sees more bumps and jolts than a roller coaster. “That means get up in 24-hours and get back (to it). Next,” Cory said. And so what’s next for Cory? He said he plans to keep on working for as long as he can, supporting his family, and taking the Cory name into the next generation in Encinitas.